Hi, I’m Jewels! Noo, not like ‘œfamily jewels’, like Jewels jewels! 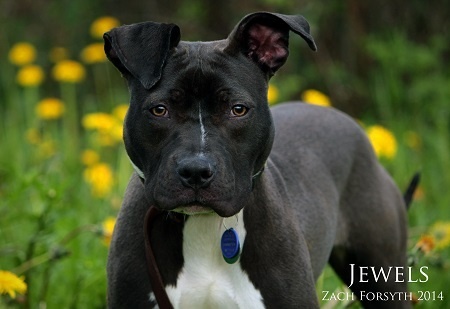 Howeverrrr, I AM looking for a great family, and I just know there is a great family out there looking for me too! I am a super happy and wiggly and playful and sweet little pitbull gal with a really cool tiny white stripe up my nose and beautiful amber eyes. Though I did get pretty lucky in the looks department, I could really care less about all that because all I wanna do is tromp around and play outside and then kick back with my favorite people and wait for dinner to be ready 🙂 I am still just a pup at 11 months old and 31 lbs small, so I will require puppy classes but that’s okay because I’m a bright little cookie and I love learning new things! I am great with other dogs, not so good with kittes, and I’m spayed, microchipped and potty-trained and my adoption fee is $250. Fill out an application at pixieproject.org and we can set up a meet and greet!